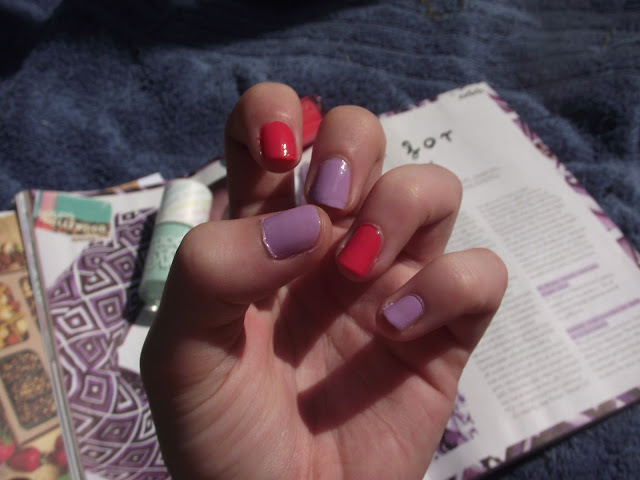 Jesska Denise: NOTD - A Pinch of Summer. NOTD - A Pinch of Summer. The sun has made me want to embrace summer shades more than usual. Bright colors look way more vibrant and fun when the sun is shining and you're holding an ice pop in your hand. I've recently added Essie 'Bond With Whomever' to my ever growing Essie collection. It's an addiction really. An expensive addiction considering the price on my local stand went from 7.99€ to 9.99€. I'll be sticking to ordering them from 'Fragrance Direct'. 1.99£ for a bottle. Way more recession friendly. I paired it with 'Cute as a Button' (also from Essie) just to make it look that little more interesting. I fail at nail art so this is the best it gets in terms of creativity. I'm constantly trying to recreate 'Islaays's nail art, but it always turns out tragically and nobody needs to see that. Practice makes perfect I suppose. Have you guys got a go to nail polish brand? Comment below and let me know. I am addicted to nail polish these days. It used to be the product I never cared about and now I had to get storage for it!